Author’s note: While preparing for this reflection, Trevor Thomson’s song, “Christ in Me Arise” kept playing in my head. I’ve incorporated some of the lyrics into this reflection. Today’s Gospel reading is the Transfiguration of Jesus, which is often described as the account that confirms Jesus as the Son of God. In this story, the disciples, Peter, James, and John, witness Jesus being encased in a brilliant, white light and speaking with Elijah and Moses. Peter wishes to construct three tents to pay homage to Jesus, Elijah, and Moses. In reply, God speaks saying, “This is my beloved Son…Listen to Him.” Then the white light vanishes and only Jesus is present instructing the disciples not to repeat what they just saw until after the Resurrection. I don’t know if the Transfiguration was an actual event, but the story reminds me that Jesus can be hidden among us. 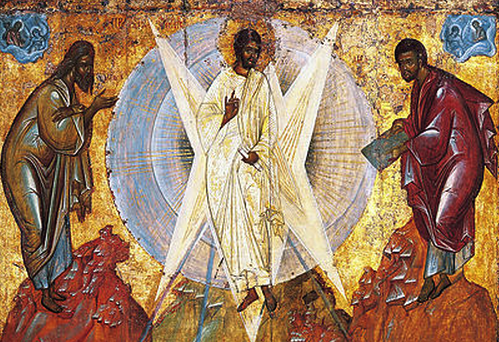 For some of the disciples, the Transfiguration revealed Christ as from God. It showed them that he was more than a prophet but the Word made flesh. The disciples upon recognizing Jesus as the Messiah thought differently of him. They saw what had already been there. The event signaled that Jesus had always been the Messiah but had been unrecognized. Perhaps Jesus didn’t fully recognize himself to be the Son of God until that moment. If so, in that experience God’s presence within was awakened in Jesus. While Jesus remains the central focus of the Transfiguration, I also believe James, Peter, and John were transfigured as well. For Jesus is fully within us and while God awakened in Christ God also awakened in us. This realization is awesome and frightening because this means we have the power to be Christ to the other. It also means Christ is in the other. At times I forget I have this power or deny possession of this power. But when we feed the hungry, clothe the naked, shelter the homeless, we are being Christ. When we forgive, when we affirm, when we comfort, when we empower we are being Christ. When we call for justice for women, for people who identify as LGBTQ, for lay people, for people of color, for church workers, for immigrants, and so on, we are being Christ. And when we are threatened and accused of heresy but continue on, we are being Christ. This Lent I am reminded to reveal the Christ within me.